GALT loaded up and headed west into the setting sun to visit the Springcreek 4H Club in Weatherford. 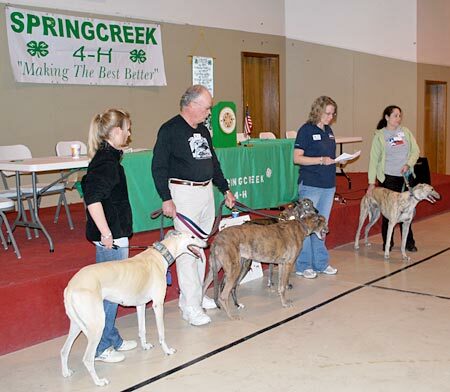 GALT was invited to attend as the program portion of their February meeting by Lori McCarty and greyhound Kylie. 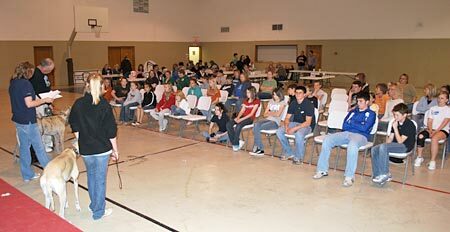 GALT volunteers and their greyhounds presented fun history and facts to a group of about 30 kids and their parents. From left to right - Leoni with Kylie, David Cole with Stanley & JJ, Sara Ramadan & Susan Hurst with Malcom.